The saying ‘like father like son’ is very truly enshrined in the life of Clive Bruce Gitsham of Tithebarn Lodge No 8446, which meets at Poulton-le-Fylde Masonic Hall. Clive’s father, Charles Gitsham, had led a very mobile life, which consisted of many changes of location and circumstances for him, his wife and four children. 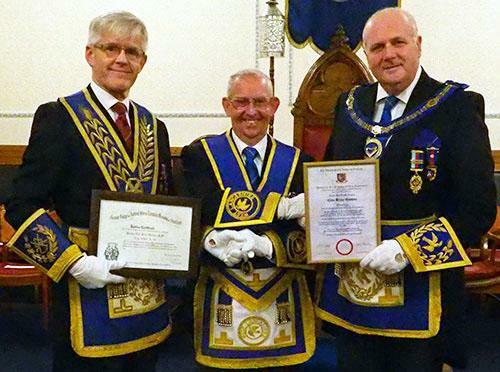 Pictured, from left to right, are: Ian Ward, Clive Gitsham and David Winder with the two 50th certificates presented during the meeting. Indeed, a family may not have existed had Charles not survived the German mine which sunk the merchant vessel he was sailing in during WW2. Charles subsequently joined the Royal Navy and was involved in protecting the Atlantic and Arctic convoys. Conditions were harsh during this period, with ice and dreadful weather being a constant trial. The members of the lodge were regaled with an intriguing history of Clive’s life both in and out of Freemasonry by Assistant Provincial Grand Master David Winder at a meeting to celebrate the 50th year that Clive had been a Mason. In all, there were over 60 Masons present to witness and assist on this occasion. David continued as follows. After the war Charles worked in a mill making tartan, this was followed by a period as a woodsman on the Bute Estate. He then moved onto the mainland where he worked as a telephone operator, a job which led to several moves of location ending up at Kilmarnock. It was here that young Clive was able to settle into a steady passage of life,which led to him attending Hamilton High School. Following school, Clive aspired to work as a joiner or metal worker but was unable to obtain an apprenticeship in either of these trades and he found his first job in a grocery shop cutting meat and cheese and selling wine. On one occasion an accident saw Clive chop the end from one of his fingers. After a quick visit to the local hospital, Clive was back at work wondering if the end of his finger was in a package of ham. Clive moved from his grocery job to become a postman, which resulted in his becoming very fit until yet another job-related move for his father to Castle Douglas. Alas, quite suddenly Clive’s mother, Elizabeth, passed away and the family moved temporarily back to Kilmarnock before Charles and three of the children emigrated to Australia. However, Clive had by this time met his future wife Margaret, whose father ran the Thistle Inn in Castle Douglas and Clive opted to stay and work at what was the only pub in town. After 10 years working in the pub it was decided to sell up owing to the deteriorating health of Clive’s father-in-law and as a result of many trips to Blackpool, a move to Martin Mere caravan park ensued. Clive was able to broker an arrangement where they lived rent-free as a consideration for acting as the security guard for the site. This arrangement enabled Clive to get a job at Weeton Army Camp accommodations store. This meant working 90 hours a week but enabled Clive to retire at the age of 45 and move to Benidorm. The plan of spending life in a warm climate was not to last however, as Margaret became ill and a move back to Blackpool was required. Being accustomed to unexpected changes in fortune, Clive soon found himself a job at the Travel Inn at Blackpool Airport, where he stayed before joining Blackpool Transport as a bus driver. Now in semi-retirement, he drives on school buses and private excursions. Clive’s work at Blackpool Transport led to his meeting with his second wife, Louise. Clive, during his latter years, was acting as a mentor for new bus drivers and Louise was one of his trainees. They met for a meal in the Millar Arms in Singleton in May, were engaged in July and married in October; at Gretna Green, where else? The rest, as they say, is history. 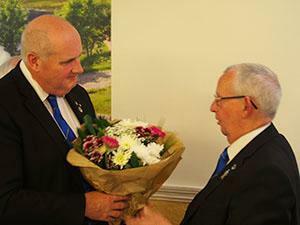 David Winder (left) receives a bouquet of flowers for his wife, Sue. Clive joined his mother lodge, LodgeSt John No 189 of the Scottish Constitution, while he was living in Castle Douglas and a few years later he joined the Mark Degree and Royal Arch Josiah Chapter No 261. Clive was very keen and notwithstanding a long list of stewards he was appointed ‘Bible Bearer’ within the first 12 months of joining. Clive took the wise move of becoming a life member of his lodge and chapter for the sum of £5 for each and is still a member of both now. He joined Tithebarn Lodge in 1984 as a result of a discussion with Mel Green. With the exception of the period when he was living in Spain, Clive has been an eager member. He was master of the lodge in 2011, during which year he attended over 50 events representing Tithebarn Lodge. Keen as ever, Clive didn’t rest on his laurels, he has since been tyler, then treasurer at Tithebarn Lodge and charity steward of Imperial Mark Lodge No 1276, in which he has also been the master of the lodge. He has also been through the chairs in Tithebarn Chapter No 8446 and is a member of The Lodge of St Mary Balham No 3661, which meets at Great Queen Street in London. David Winder was pleased during this meeting to be able to present Clive with two 50th year certificates. One on behalf of Tony Harrison,Provincial Grand Master of the Province of West Lancashire, then a second one on behalf of Dennis Warren, Provincial Grand Master of the Province of Galloway, of the Scottish Constitution. 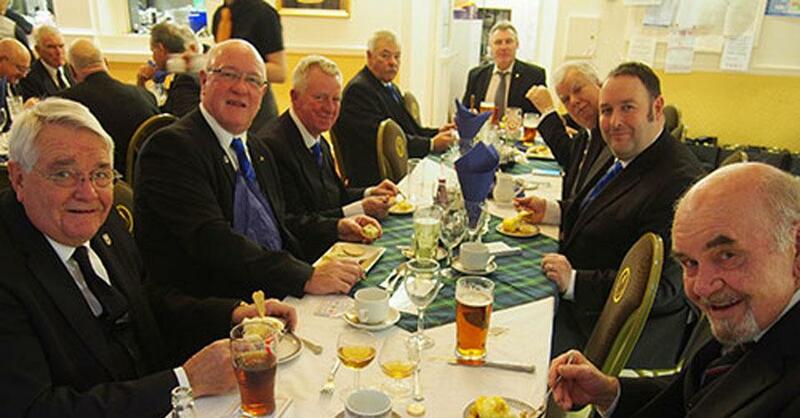 At the end of the meeting the brethren retired to the banqueting suite for a fine meal, which, quite naturally, included a haggis course amongst several others. Replying to a pleasing toast to his health, proposed by Tom Sloan, Clive Gitsham thanked everyone for their attendance, particularly those who had travelled down from his mother lodge in Scotland. He also thanked many members of Tithebarn Lodge for their support over the years and particularly thanked David Winder for his time and work in compiling the story of his life. Pictured, from left to right, are:Glyn Lloyd, David McKee, Danny Chester, John Pitches, Ken Greenwood, James Whiteside, Ben Gorryand Tom Sloan.